This is the first bulletin from ‘S’, one of our local members, who is participating in a programme with Quaker Peace and Social Witness as an ecumenical accompanier serving on the World Council of Churches Ecumenical Accompaniment Programme in Palestine and Israel (EAPPI). On Saturday we drove out to Nabi Samwil, a remote and impoverished village north of Jerusalem. We are told that the village is under siege, with Israel trying to squeeze them out of the land they have lived on for generations. Israeli authorities have forced the villagers out of their homes and turned the area into an archaeological site and nature park. The villagers now live in ramshackle buildings in a small enclave across the road from the nature park. There is a nearby mosque, which used to house a school as well. About fifty children from the village must now be bussed to a school 9 kilometres away and they must pass through a checkpoint on the way. For the children the checkpoint can be a frightening and humiliating experience. In Nabi Samwil we met Eid, a gentle yet determined man, who struggles to keep his land and to ensure the survival of his village. Since 2011 they have been trying to fight through the courts and now have the support of lawyers from NRC (Norwegian Refugee Council). 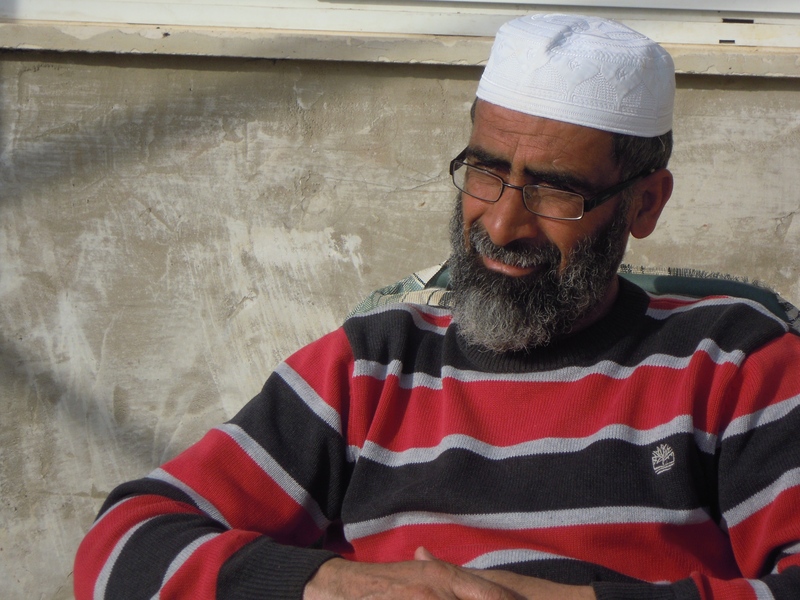 Eid’s house has been demolished twice and he moved his family into a caravan but the soldiers came and took the caravan away. He once planted 300 trees, olives, apple, and pomegranate. Settlers came and uprooted them. He planted again and then settlers flooded his land with raw sewage so all the trees died. Four years ago he tried to bring food for his animals, his sheep and cows, but was stopped at the checkpoint and arrested. The shelter for his animals was destroyed so his dairy cows became sick and could not give milk. So he lost his small business selling milk. He no longer has any animals at all. Eid, a community leader in Nabi Samwil. He seemed a wise and gentle man. We receive regular SMS alerts of clashes from the UN office here. “16:36, ongoing clashes between Palestinians and ISF at entrance to Ar Ram town.” “17:30 in At Tur (Mount of Olives) on-going clashes.” “19:30 clashes between the IDF and residents at Wadi Al Joz in East Jerusalem.” All advised to avoid the area. I can hear the stun grenades and tear gas bursts just north of where I live. Twice a week we have checkpoint duty from 4:30 to 7:30 at Qalandiya between the Palestinian cities of East Jerusalem and Ramallah. At that time in the morning it is cold and dark. Over two thousand people pass through in the three hours we spend there. To enter the checkpoint men must walk through long and narrow metal cages with a turnstile at the end. Only a few are allowed through at a time. There can be a chaotic scramble at the entrance to the gates as the men are desperate to get through in time so they are not late for work. A man was injured in the crush today, not badly, but then sometimes arms are broken or hands injured. Men have died of heart attacks in what we call the cattle lanes. There is a special lane to one side – the humanitarian lane, to be used by women, children, the sick and elderly. A female soldier was holding up the humanitarian lane for no reason that she explained or that we could see, asking everyone for their IDs and permits. When it is time to leave I line up with the men though I could go through the humanitarian lane. We all do this as a gesture of solidarity. The men let me go ahead and make sure there is space around me. I wonder how they have the heart to do this every day. They show courage and forbearance, humour and kindness. 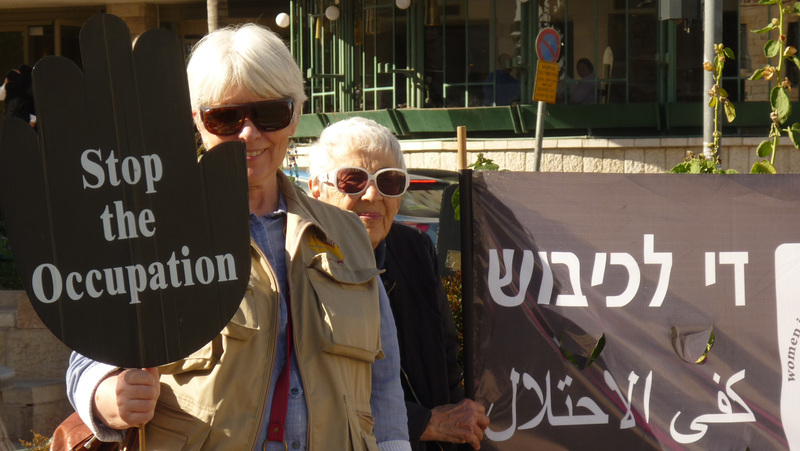 At the Women In Black demonstration in West Jerusalem. They are Israeli women and have been demonstrating against the occupation for twenty-seven years.